This post is sponsored by The Home Depot. My favorable opinion is 100% my own! When we bought the Florida house, the backyard potential was a huge selling factor. In all of our previous homes we’ve never had an actual fenced in yard or large(ish) patio space, so the opportunity to have both was very appealing. Since the interior of the house needed so much immediate attention, we didn’t really do anything with the backyard/patio until recently. 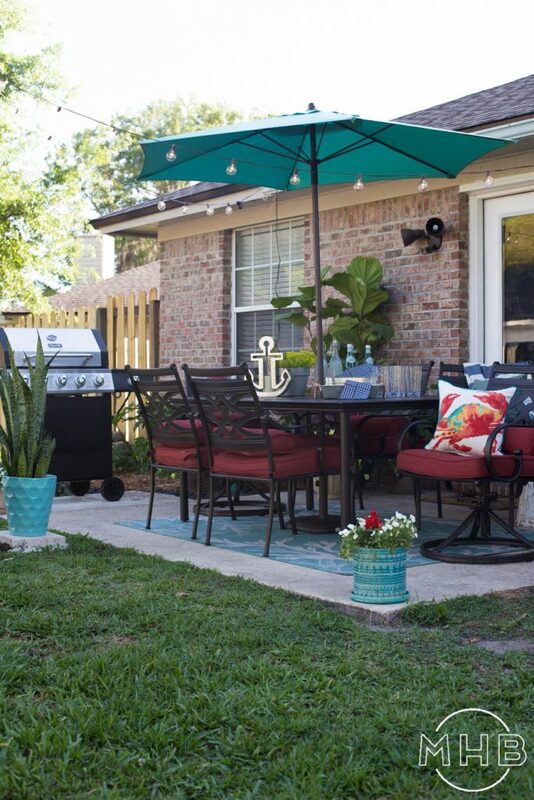 When The Home Depot invited me to participate, again, in the Patio Style Challenge, I knew this was the perfect opportunity to transform our patio space! The before seems so far away now that I can’t even remember the dirt stained concrete block, but this picture reminds me of what it once was. I wish I had a before before and you could see the awful slider that we replaced with these french doors. That alone made a huge difference. Before we started the styling of the patio we had someone come out and power wash the concrete. Guys! Power washing is amazing! It was worth every penny. Matt and I watched through the window like puppy dogs as the guy revealed the bright concrete hiding under the caked on dirt. The Home Depot sent us the Middletown Patio Set which is the absolute perfect size for our space. Six chairs mean ample seating for our family plus friends. 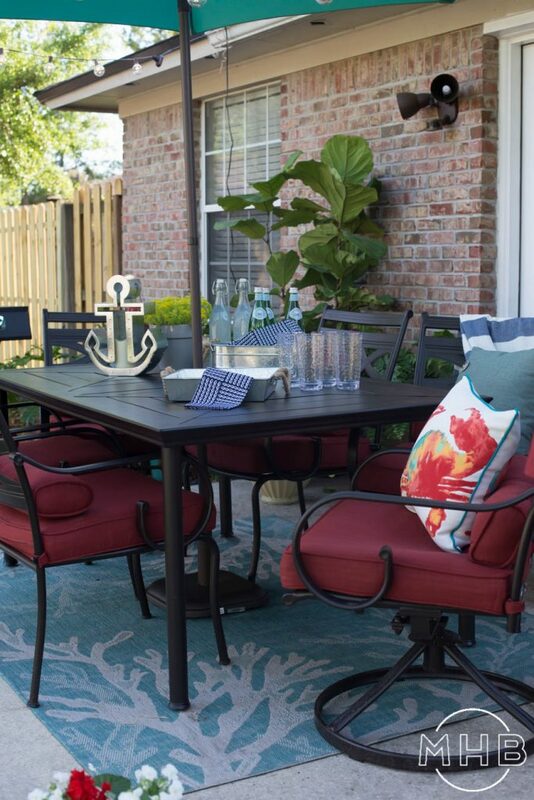 My favorite part of the Patio Style Challenge was styling the space. So fun! 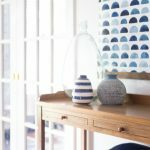 Since coastal decor is my true love, I wanted to add lots of blues and aqua to the space. I loved this coral reef outdoor rug paired with the aqua umbrella. How cute is this little crab pillow? I thought it was the perfect way to tie together the red and aqua. 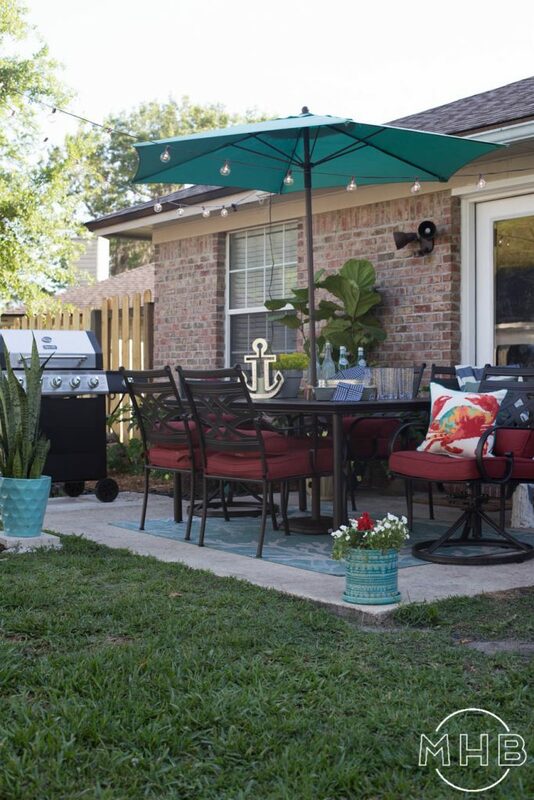 Since spring has definitely sprung here in Florida, this makeover couldn’t have come at a better time. We’re already getting a lot of use out of this space. We’ve been enjoying afternoon chats, family dinners, and cookouts. With more to come all season long, I’m sure! 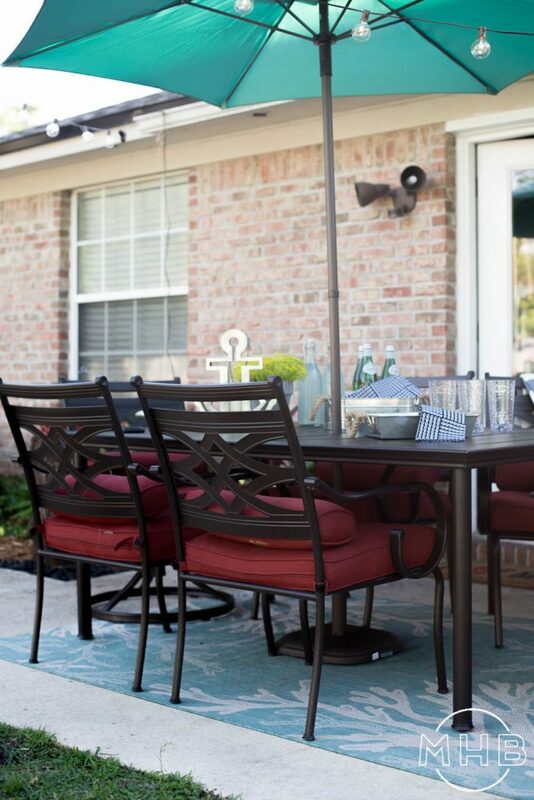 It’s the perfect outdoor living and dining space. I love these accessories I picked up at The Home Depot, as well. 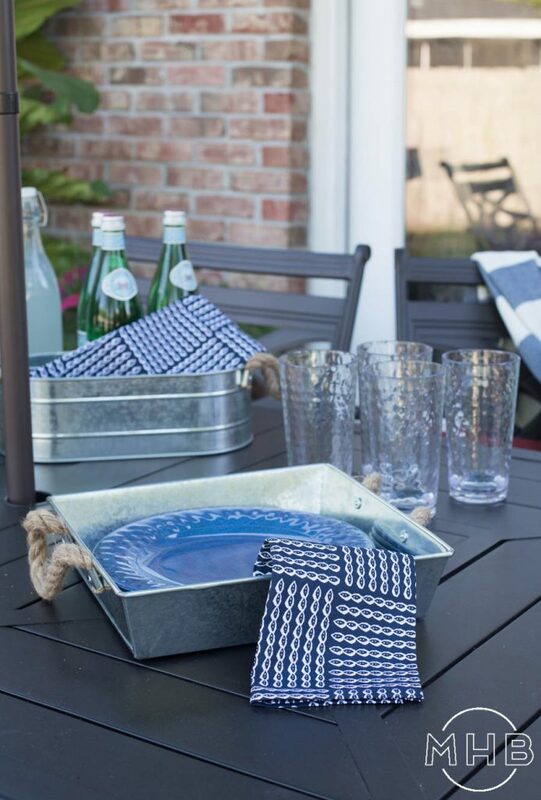 These plastic tumblers and melamine plates are perfect for meals al fresco. I’m really easy to please when it comes to what I want in an outdoor space. 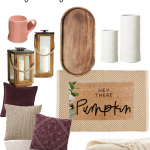 I imagined my ideal outdoor living space having three must haves: plenty of seating, string lights, and plants. Let me tell you, all of the boxes got checked off here! 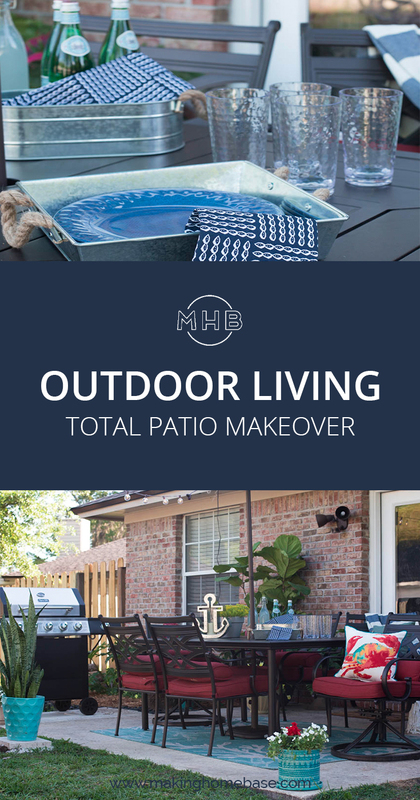 I’m so thrilled with the way our patio makeover turned out! 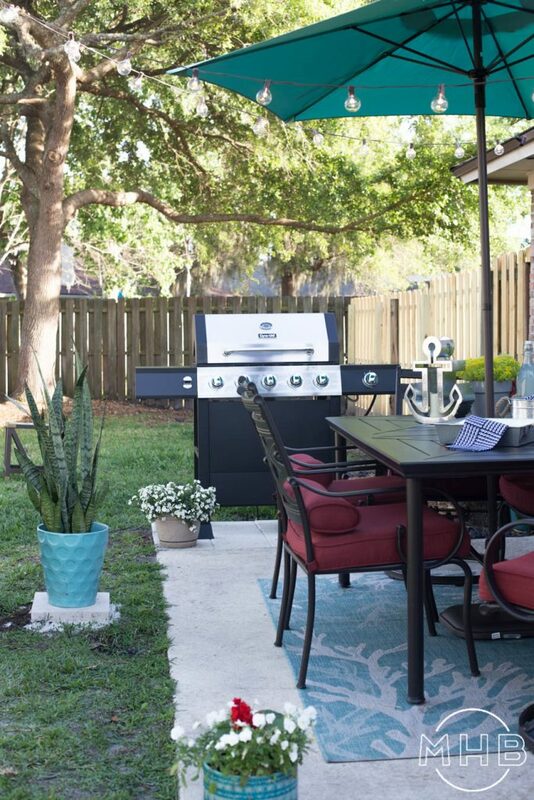 We couldn’t have dreamed up a better outdoor space for our family. 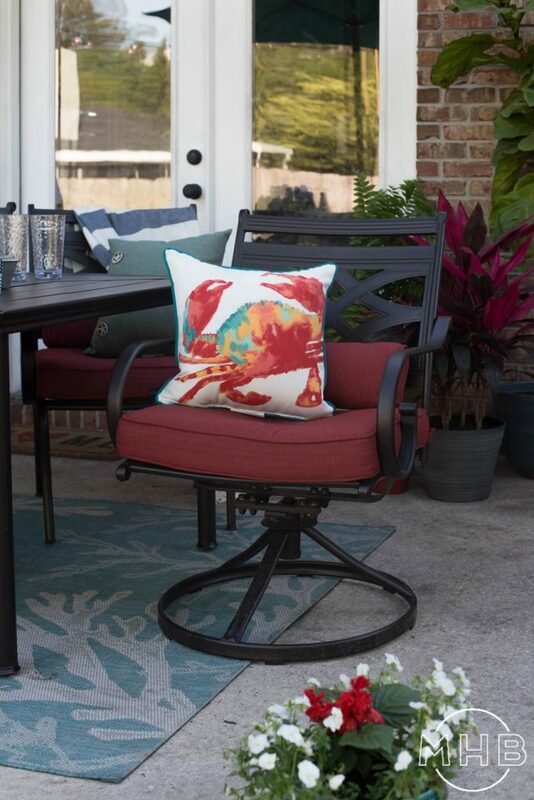 You can see even more of our patio makeover plus my favorite accessories over on The Home Depot Blog. This transformation is awesome, Chelsea! It’s amazing what some elbow grease and new stylish accessories can do! Looks awesome!!! Love it! It gives me lots of ideas for my sad little garden space. I think I need to a rug & umbrella, and things will really come together! Hi Angie! Thank you so much! You can totally do it! Beautiful transformation! 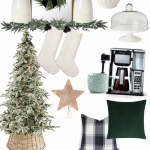 Love the rug, lights well everything! Thanks so much, Debbie! We are really enjoying it! Love the new look! Where is the Anchor thing from? I need that for my nautical patio here in Michigan! This looks so awesome Chels! And what a huge transformation. 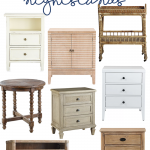 I’m sure you will be enjoying this year round! Thanks, T! 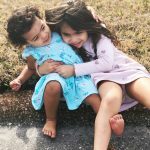 For sure – Florida is perfect for it! Absolutely LOVE!!!! Colors are exactly what I want to do to our deck. And I was wanting to hang lights as well. But, as a Maryland gal, my absolute favorite is that crab pillow! WANT!!! Yes! It’s the perfect little pillow! They actually have a great assortment of nautical style pillows. Love em’ all! I Love your outside space. The colors are wonderful, it looks very comfortable. Enjoy. This is a beautiful space! I’m glad you mentioned the wow factor of pressure washing. I NEED to get our porch power washed but have been mega procrastinating. Maybe you just gave me the kick I needed. The refreshed, bright white concrete makes a huge difference! HUGE difference! Totally worth it!